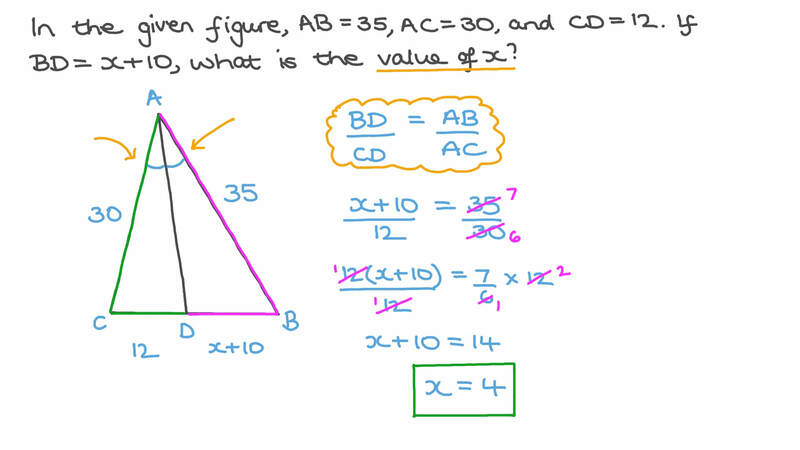 In this lesson, we will learn how to use the angle bisector theorem, its converse, and the incenter theorem to solve various problems. In the given figure, 𝐴 𝐵 = 3 5 , 𝐴 𝐶 = 3 0 , and 𝐶 𝐷 = 1 2 . If 𝐵 𝐷 = 𝑥 + 1 0 , what is the value of 𝑥 ? In the figure,  𝐴 𝐷 bisects ∠ 𝐵 𝐴 𝐶 , 𝐵 𝐷 = 8 , 𝐷 𝐶 = 1 1 , and the perimeter of △ 𝐴 𝐵 𝐶 is 57. Determine the lengths of 𝐴 𝐵 and 𝐴 𝐶 . Given that angle 𝐴 is bisected by 𝐷 𝐴 , 𝐴 𝐵 = 3 8 , 𝐴 𝐶 = 1 8 , and 𝐵 𝐶 = 2 8 . Determine the lengths 𝐷 𝐵 and 𝐷 𝐶 . If 𝐴 𝐵 = 3 0 c m , 𝐵 𝐶 = 4 0 c m , and 𝐴 𝐶 = 4 5 c m , find the ratio between the areas of the △ 𝐴 𝐸 𝐷 and the △ 𝐴 𝐸 𝐶 . Find the lengths of 𝐴 𝐶 and 𝐴 𝐷 in the figure. If △ 𝐵 𝐴 𝐷 is a right-angled triangle at 𝐴 , 𝐴 𝐶 = 1 0 c m , 𝐶 𝐸 = 1 2 c m , and 𝐸 𝐴 = 1 5 c m , calculate the value of 𝑥 . If 𝐴 𝐵 𝐶 𝐷 is a quadrilateral in which 𝐴 𝐵 = 1 0 c m , 𝐵 𝐶 = 5 c m , 𝐶 𝐷 = 6 c m , 𝐴 𝐷 = 1 1 c m , where  𝐴 𝐸 bisects ∠ 𝐴 and 𝐵 𝐷 intersects at 𝐸 , find the value of the ratio 𝐵 𝐸 𝐸 𝐷 . Given that 𝐴 𝐵 𝐶 is a triangle in which 𝐴 𝐶 = 1 0 c m , find the value of each of 𝑥 and 𝑦 . In the triangle 𝐴 𝐵 𝐶 , 𝐴 𝐵 = 7 6 c m , 𝐴 𝐶 = 5 7 c m , and 𝐵 𝐷 = 5 2 c m . Given that 𝐴 𝐷 bisects ∠ 𝐴 and intersects 𝐵 𝐶 at 𝐷 , determine the length of 𝐴 𝐷 . Given that in the figure, 𝐴 𝐵 = 8 , 𝐵 𝐶 = 1 5 , and 𝐴 𝐶 = 2 0 , what is 𝐸 𝐵 ? If 𝐴 𝐵 ∶ 𝐴 𝐶 = 3 ∶ 5 and 𝐵 𝐷 = 2 7 c m , determine the perimeter of △ 𝐴 𝐵 𝐶 . Using the figure below, find the length of 𝐴 𝐷 to the nearest hundredth. In triangle 𝐴 𝐵 𝐶 , 𝐷 lies on 𝐴 𝐶 such that  𝐵 𝐷 bisects ∠ 𝐴 𝐵 𝐶 . Given 𝐴 𝐵 = 1 0 , 𝐵 𝐶 = 2 0 , and 𝐴 𝐷 = 6 , determine 𝐴 𝐶 to the nearest hundredth. Use the figure to determine length 𝐴 𝐷 to two decimal places. Given that 𝐴 𝐵 = 6 0 , 𝐴 𝐶 = 4 0 , and 𝐵 𝐶 = 3 1 , what is 𝐶 𝐷 ? 𝐴 𝐵 𝐶 is a right-angled triangle at 𝐵 , where  𝐴 𝐷 bisects ∠ 𝐴 and intersects 𝐵 𝐶 at 𝐷 . Given that 𝐵 𝐷 = 1 8 c m , 𝐵 𝐴 ∶ 𝐴 𝐶 = 4 ∶ 5 , determine the perimeter of △ 𝐴 𝐵 𝐶 . In the given figure, if 𝐴 𝐵 ∶ 𝐴 𝐶 ∶ 𝐵 𝐶 = 6 ∶ 9 ∶ 1 1 , find 𝐵 𝐷 ∶ 𝐷 𝐶 . If 𝐴 𝐵 = 2 5 c m and 𝐴 𝐶 = 2 1 c m , find 𝐵 𝐸 𝐵 𝐶 . Leave your answer as a fraction in its simplest form. Suppose that in the figure, 𝑚 ∠ 𝐷 𝐴 𝐶 = 3 4 ∘ . What is 𝑚 ∠ 𝐸 𝐴 𝐹 ? 𝐴 𝐵 is a chord in a circle. 𝐷 ∈ major arc 𝐴 𝐵 such that 𝐴 𝐷 𝐷 𝐵 = 1 2 . 𝐸 is the midpoint of the minor arc 𝐴 𝐵 . 𝐷 𝐸 is drawn to intersect 𝐴 𝐵 at 𝐶 . Determine the ratio between the areas of △ 𝐴 𝐷 𝐸 and △ 𝐵 𝐷 𝐸 .
𝐴 𝐵 𝐶 is a triangle in which 𝐴 𝐵 = 3 2 c m , 𝐵 𝐶 = 3 3 c m , and 𝐴 𝐶 = 1 6 c m . 𝐷 ∈ 𝐵 𝐶 , where 𝐵 𝐷 = 2 2 c m , 𝐴 𝐸 ⟂ 𝐴 𝐷 and intersects 𝐵 𝐶 at 𝐸 . If 𝐴 𝐷 bisects ∠ 𝐵 𝐴 𝐶 , find the length of 𝐶 𝐸 . Given that 𝐴 𝐵 = 𝑥 + 5 c m , 𝐴 𝐶 = 2 9 c m , 𝐶 𝐷 = 3 8 c m , and 𝐵 𝐶 = 3 8 c m , find the numerical value of 𝑥 . In the shown figure, determine 𝐴 𝐷 ∶ 𝐵 𝐷 .
𝐴 𝐵 𝐶 is a triangle, where 𝑋 is the midpoint of 𝐵 𝐶 , 𝐵 𝑋 = 2 3 c m and 𝐴 𝑋 = 2 3 c m . If the bisector of ∠ 𝐴 𝑋 𝐵 intersects 𝐴 𝐵 at 𝐷 , find the value of 𝐴 𝐷 𝐷 𝐵 . In the figure, 𝐴 𝐵 ∶ 𝐴 𝐶 = 4 ∶ 7 . What is 𝐵 𝐷 ∶ 𝐵 𝐶 ?